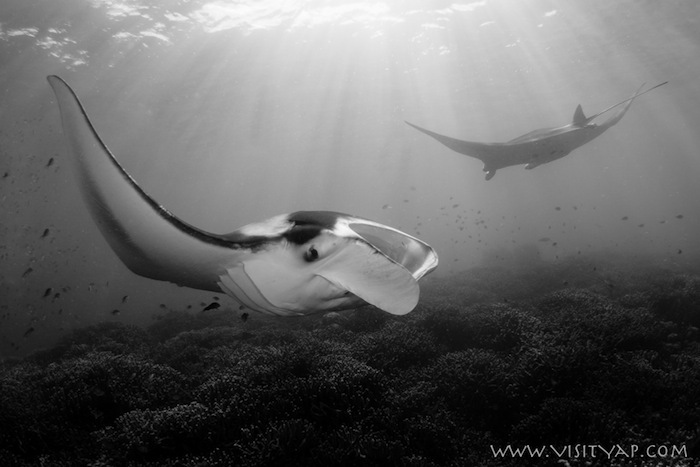 Yap lead the world in manta ray conservation with the establishment of the first government-backed sanctuary in 2008. The protected area is 8,243 square-miles, comprising of 16 main islands and atolls as well as 145 islets. Today the 2008 sanctuary law is receiving new attention through a joint island project team tasked with creating a regulation and management program. Yap State Resources and Development Marine Division and the Environmental Protection Agency are currently working on legal additions that will define how the original sanctuary law is to be managed. The legislation acknowledges Yap's marine ecosystem which creates a year-round habitat for these animals. The consistency of Yap manta ray diving is the strongest in the world and it's value is cited in the law, calling it "…an irreplaceable haven to manta rays, and a priceless treasure for the visitors and peoples of the State of Yap." It is said that the world's manta ray populations represent $140 million dollars in revenue – on average each individual ray can create $1.4 million dollars of tourism income throughout it's lifetime. By creating a local economic model based on sustainable manta ray tourism and protection, these animals and their habitat have a bright future. It's estimated that 80%-90% of all visitors of Yap came here to dive with the manta rays. Making the rays the island's most valuable local economic resource thus far. Yap's protection law spans the coastal waters as well as the habitat, including the mangroves and inner lagoons where mantas clean, feed and are believed to give birth. There is no other culture on earth that should be more concerned with conserving the ocean than the Micronesian people. The total land mass of the hundreds of Micronesian islands if combined, would not equal that of the Los Angeles area – however, Micronesia's footprint in the blue is about the size of the United States. 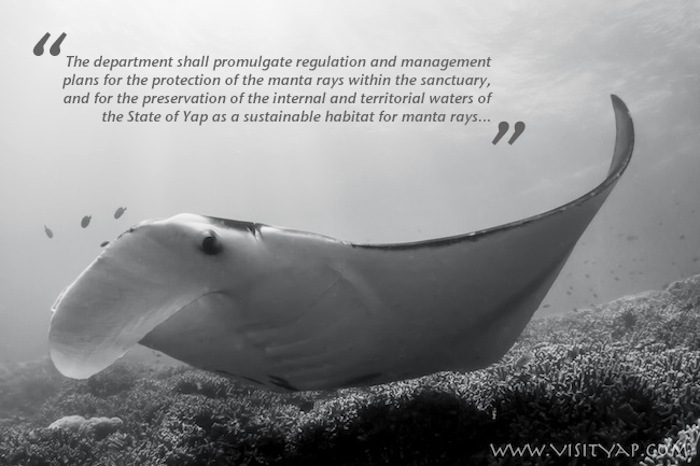 There is in the marine ecosystem of the State of Yap a remarkable bio-network of cleaning stations, sufficient density of planktonic organisms, and a pollution-free environment, which allows Yap's manta ray population to be yearlong residents. Everything that impacts a manta ray's life from commercial fishing, mooring lines to diving and snorkeling is being examined for regulation. 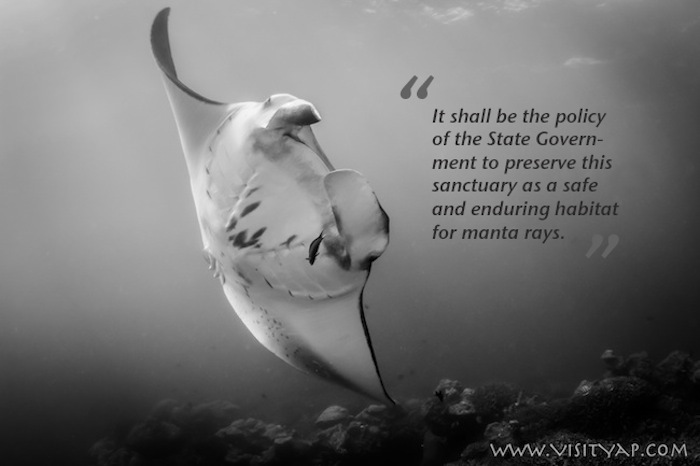 The law itself is quite heavy-handed in terms of the consequences for intentionally, negligently or knowingly injuring, harming or killing a manta ray within the sanctuary – the act is a felony that comes with minimum jail time and huge fines. The traditional mindset of the Yapese people understand the benefit for all and that's what has been realized in legal terms for their manta rays. Traditional Yapese culture is based on sustainable use of their land. For thousands of years these lands have produced all of their food, medicine, clothing and building materials in a sustainable practice. Now it's in black and white. This is the land where the modern world meets an intact traditional culture and where traditional values have been given legal nomenclature. Creating a realistic protection and management plan is a difficult undertaking given the the state's water size and limited resources. Fortunately, this population of rays has been under research by Guam-based Julie Hartup with MantaTrust.org. Julie has been studying Micronesian manta rays and collecting data in Yap for several years. She is volunteering her time and knowledge of manta ecology to assist in establishing effective regulations that protect manta rays throughout Yap and the state's outer islands. She brings required critical data on Yap's manta population that would otherwise be unavailable to a small island state government. Stronger manta protection from a scientific perspective. Yap's manta ray presence is strong enough that it has been a field research center for Manta Trust since 2009. By understanding the lives of Micronesia's mantas, we'll know where to start protecting them. Julie brings research-backed recommendations on protecting this island's resource and she hopes to expose where Yap's mantas are most vulnerable by bringing 8 years of data; their sizes, growth rates, where they were observed and when, what they were doing and with who – information that will guide drafting of the protection regulations. This is the team of people who go to work ever day to preserve the State's natural resources, protect our ocean and are putting traditional practice into legal action. Yap is the original manta diving destination with decades of tourism based on very predictable sightings. Observing mantas in Yap is a personal interaction and visitors see most behaviors diving or snorkeling shallow sites close to shore every day.